Looking a this painting propped up on a set of spare easels across the room, provides distance and softer more random lighting that lets the interesting use of colors, the flow and the interaction of the different shapes, play out musically. Above is the work table for Prayer that was rolled around the floor following every move. This photo is much the same as a similar one taken many month earlier. Again, a new artwork workplace starts clean with a tube, a couple of jars of white, and a few scattered rulers. As you can see things get messy from then on. When the project is over the paints are piled up and over onto each other including a couple dozen tubes of paint that are buried. Although finding paints can be time consuming this method of work will never change, because to put the jars back after being used, leaves the possible question later on, of what colors were used? 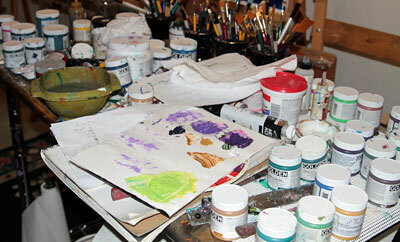 Understand, too much organization definitively slows the creative moment, and can make the artist too cautious. When you are in the zone, the only thought should be how best to apply and move the paint. First image It’s a Man’s World 24inches by 6 feet. A smaller canvas was picked which makes it easier to break the current style. It does takes less of everything to form an impression, or change a direction when using a six foot canvas. The current thought is to look back to the Birthday painting from late July 2010. There has been this continuous feeling that more was done that day to push this art forward, then anything after that. After July the biggest stylistic change was thought to be the move to round the notes. Looking at The Birthday painting, The Long and Winding Road, it accomplished its goal with its blended look, much different from what has followed. There is no thought to duplicate that past, but there are lingering feelings that have continued to bother as if something had not yet been resolved. But that is going to change now, with Man’s World. There is finally the insight to what occurred that July day, which turns out to be obvious: That work brought the background forward and mingled it with the musical flow. That was surprisingly easy to do then, because that work was painted based on a Van Gogh landscape. Since then nothing like that has been tried again. So, it is no wonder that what occurred that day was a one-hit-wonder. That brings us to the current goal of trying to close the door on that late July. That can be accomplished with this painting by lifting the background and moving it closer to the front where the music is. Do that without the help of a Vincent painting being used as a template will be a small evolution, that is for sure. But it will be a concerted effort, to hopefully move every bit of this art forward in one big chunk. We shall see. ~ by Scott Von Holzen on 06/22/2011.